Truth be told that’s it for the spooky stuff, but we’ve got some good old superhero action with The Terrifics, and Return of Wolverine, and if I might add a touch of space-opera in Star Wars: Dr. Aphra. All of those books, while not horror books, do have anxious moments of intense action, scary even. So don’t count them out till you’ve heard the reviews. Have a terrifyingly good time. Support the show by becoming a member of our Patreon. This time, Koom travels to Cardiff, Wales, to talk to David Roach, an artist who’s done work for 2000 AD, Dark Horse, and DC, and is currently working on Dr. Who Magazine in the UK. He’s also a comics archivist and historian, and has written several books about Warren Comics artists of the ‘70s, and one about great British comics creators. He tells Koom what inspired him to be an artist and how he broke into comics, and whether living the dream has lived up to the hype. Comic News Insider Episode 754 – Iron Deficiency Fist! Comic News Insider: Episode 754 is now available for free download! Click on the link or get it through iTunes! Sponsored by Dynamic Forces. Jon Hoche returns to the rotating co-host chair! They chat about the big lightsaber battle in Star Wars: Rebels and Jimmy is madly prepping for the upcoming MoCCA Festival. And yes, they talk way too long (some would say ad nauseum) about Iron Fist. News includes: Clueless continues in comic book from Boom!, DC Comics faces some Dark Days, Will.i.Am is bringing an alien/zombie/hip hop themed comic to Marvel, KISS and Vampirella are teaming up at Dynamite Entertainment, a Matrix reboot/relaunch/rehash/re-something is in early development at Warner Bros., a Venom film is coming out next year and more! Leave your iTunes comments! 5 stars and nothing but love! Also, get a hold of us! Comic News Insider Episode 726 – NYCC: Paul Cornell/Nick Abadzis/Simon Fraser/Michael Molcher! Comic News Insider: Episode 726 is now available for free download! Click on the link or get it through iTunes! Sponsored by Dynamic Forces. At New York Comic Con, Jimmy chatted with Michael Molcher (2000AD PR Coordinator) all about 2000AD! 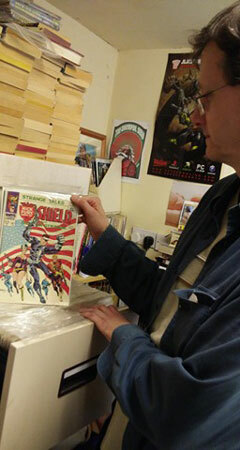 The comics, the history and more. He talked to Nick Abadzis (10th Doctor Who comics) and Simon Fraser (11th Doctor Who comics) about their particular Doctor Who comics, their favorite Doctors and companions and other adventures in the Who-niverse. And finally, he interviewed Paul Cornell (3rd Doctor Who comics/Saucer Country) about his current comic and novel work including the upcoming Vampirella series. Leave your iTunes comments! 5 stars and nothing but love! Also, get a hold of us!